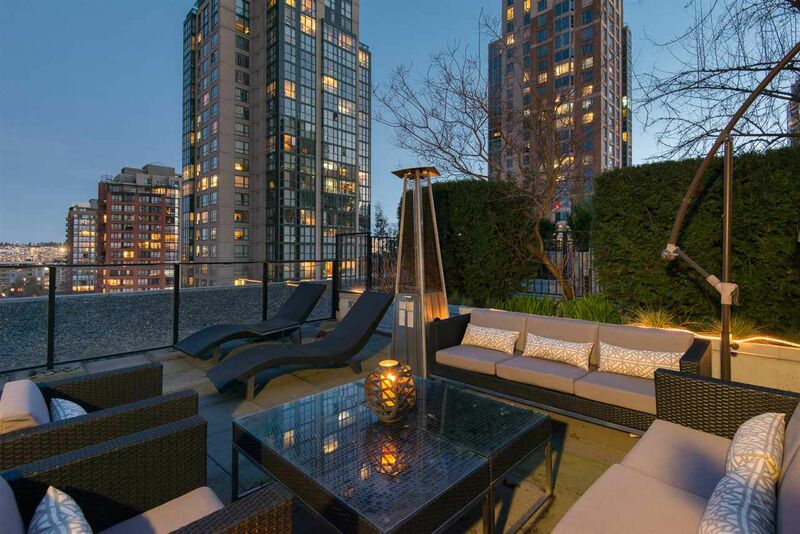 DISCOVER Design in this ALDA PENTHOUSE! 1715 sq ft of Open spaces! Gourmet kitchen with Gaggenau, Sub Zero, & Italian Murano glass. Dining room is graced by subtle ceiling detail and Bocci light fixture. Walnut floors throughout. Master suite features private dressing room, Steam room, & double sided fireplace to covered deck. Gorgeous millwork conceals executive office. second bed features private ensuite. Beautiful powder rm! Custom rolled steel staircase leads to private massive roof deck with outdoor kitchen- DCS BBQ, smoker, fridge, warmer, ice bin & marble counter. Sparkling views past David Lam Park, through False Creek and to the city lights beyond! Air conditioning, dedicated laundry room, 2 prkg, storage. Must be seen to be appreciated!